This classic farmhouse table comes standard in a 42" wide square but you can also choose to order it in a wide variety of other sizes the largest being a 60" wide square. You can also add up to 20 twelve inch extensions which would add on an additional 20 feet to the table size you select. 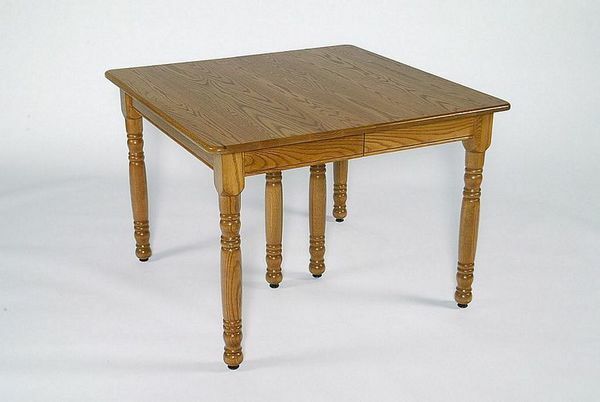 This is the perfect table for someone looking to have an small every day dining table but needing the ability to enlarge it for family gatherings, parties and events. Choose to order this farm table in oak wood for a more country looking farm table or go with something more unique and trendy like walnut wood. You also choose your finish from a natural no stain varnished finish to a dark black onyx and then everything in the middle. We are happy to send out wood finish samples to help you decide on the finished look for your table. Painted, two tone and distressed finishes are also available for this classic farm table. Shop DutchCrafters today for all your kitchen and dining furniture needs.